host Of unique and refined details. • Analogue pre-programmable range setting system. • Profiled limbs for optimum recovery and performance. • C.N.C. machined aluminium cams with high energy wheel set up. • Ultralight trigger mechanism, A triple action sear mechanism giving a super light release - essential for consistent accuracy. Each unit individually factory tested. • High density aluminium extruded track for consistentarrow tracking. • Super string. This increases normal bow string life by 8 times. • Long range profile rear peep sight with adjustable focal length. • Scope mount ramp. Micro click adjustable - for ranges 15-100 metres. • Automatic ambidextrous safety catch. The REVOLUTION XS has a lightweight machined riser featuring a 160-pound solid limb design. Combined with the precision CNC high energy wheels & the Veloci-Speed Cable Assembly this bow shoots a 22” arrow over 340 feet per second. The REVOLUTION XS also features an adjustable rear stock and cheek piece for the maximum in comfort along with foam grips and a quick detach front end for easy storage. Standard Realtree Hardwood Camouflage. Max Hunting range - 60 yds. The REVOLUTION is HERE! This carefully designed crossbow just brought hunting to a new level of performance, comfort and efficiency. The REVOLUTION is loaded with features with the optimum hunting experience in mind. Features like the 3 1/2”Adjustable Cheek Piece and 2” Adjustable Rear Stock make for a custom fit with just a simple adjustment. The Quick Detach front end sets up and breaks down in seconds with the push of a button. The unique range gauge system allows you to instantly adjust your yardage and elevation with the turn of a dial. 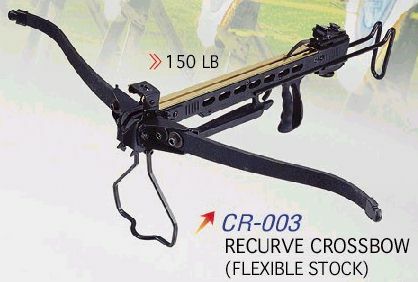 But the revolution does not stop there, the “Veloci-Speed” Cam and Cable System bring this crossbow to a whole new level, with stored energy of 122 foot pounds launching arrows at speeds of 345 feet per second. The REVOLUTION offers quality and ease unmatched by any other crossbow. The all-new Rhino Sport Magnum offers comfort, style, value and features exclusive to Barnett. This bow features the Veloci-Speed cam with synthetic cable and string system, a 13” power stroke and propels arrows up to 320-fps. Added features include the lever-action breakdown mechanism for easy storage, an adjustable fore grip, and an ambidextrous Monte Carlo stock make for a quality bow at production cost. The all new Quad 400. We have done it again. Speed, comfort, looks, and value. Born from the Quad 300, you have an all new composite stock, vented quad limb assembly coupled with our "Veloci-Speed" high energy cam system, a thumbhole grip, and a built in crank cocking device attachment (crank device is optional). You've got unmatched power at an affordable price. Redefined for 2004, the Quad 400 is everything you expect from its predecessor and a whole lot more. The Quad 400 features a thumb whole grip, a 15 1/2” power stroke and “System 4” Limb design producing arrow speeds of over 335 feet per second. The high tech composite stock is lighter, more comfortable and contains an integrated cocking device attachment. A contoured cheek piece not only conceals the attachment but also adds to its comfort and appeal. Wheel Type - Cam The Quad-300 the most powerful production crossbow available just got better. The unique “System 4” limb design is now teamed with the “Veloci-Speed” Synthetic String, Cable and Cam system which provides for a faster, quieter and more efficient bow than ever before. All this combined to deliver power, performance, long-range accuracy and an incredible speed of 335 feet per second. Front and Rear sights included with each bow. The Future of crossbow shooting is here today with Rhino, our most powerful bow.With it's 160 lb draw weight, this crossbow achieves a release velocity of up to 280 fps. All that performance and only weighing 3.3 kg. Rhino also features the state of the art technology featuring in our "New Generation" of crossbows, such as the ultra light trigger mechanism. A triple action sear mechanism giving a super-light release, which is essential for consistent accuracy. Lightning, a powerful, stylish crossbow, is available in a range of finishes. These include the usual sleek matt black finish, a full length beech wood stock fitted to the crossbow or a super smooth red marble finish. The Lightning is fitted with multi reticule adjustable foresight. The Lightning also features the state of the art technology featuring in our "New Generation" of crossbows, such as the ultra light trigger mechanism. A triple action sear mechanism giving a super-light release, which is essential for consistent accuracy. Lightning marble crossbow, Super smooth red marble finish illustrated with standard rear sight. 106cm x 27cm. A professional bow with "red dot" sight for the serious user"
106cm x 27cm. A professional bow for the serious user. You're never to young to enter the excitng sport of archery wIth Barnett. All models are avaIlable IndIvidually or In ready~to~use kits, complete with armguard, finger tab and arrows. TARGET NOT INCLUDED The popular Bandit Toy Crossbow is a fun and exciting way to teach valuable hand-eye coordination to the young. 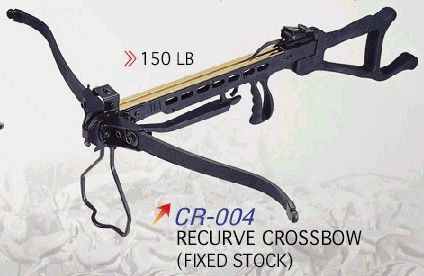 With a choice in either yellow or black, the miniature crossbow is an extremely well-built toy that will last for years. 545 LITTLE BANSHEE KIT: A 15lb draw weight compound bow suitable for 8 years and upwards Kit includes 3 cedar arrows, armguard, finger tab and target face. complete with a full archery handle with adjustable sight pin. A must for clubs and schools. Kit includes 2 alloy trainer arrows, pro - armguard and leather finger tab. pro - armguard and leather finger tab. 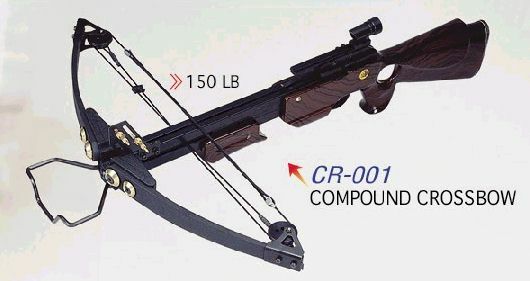 076 BANDIT TOV CROSSBOW: This C.E. Safety Approved toy will provide hours of fun for years to come Safety sucker darts mean that it's perfectly safe for children 8 - 80. Comes complete with 3 safety darts and dartboard Target game. for centuries, this bright plastic replica never fails to provide endless hours of enjoyment. 075 BLOW GUN: Great fun for all 'kids'.The one way mouthpeice ensures that darts cannot be inhaled. Comes complete with foam quiver, 4 darts and jungle fun target. 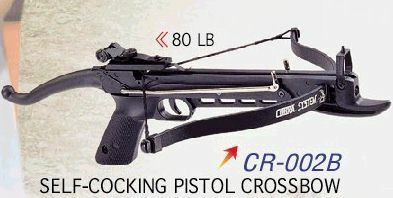 Self cocking pistol cr002 crossbow with metal body.